We have new kits in the Embroidery Kits section of the store. 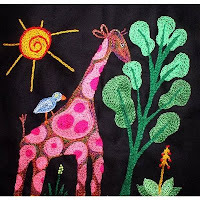 Leora Raikin, creator and owner of African Folklore Embroidery, developed these basic kits for beginners to learn this beautiful form of South African needle art. 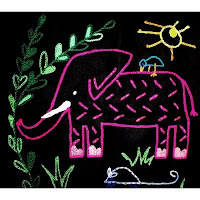 African Folklore Embroidery Kits feature an authentic embroidery design drawn by South African artists. The basic kit includes an 11-1/2" square design stamped on black cotton fabric. Each kit also includes 6 skeins of brightly colored threads and an embroidery needle. The bright threads make a striking contrast against the black fabric. Instructions include helpful guidelines to getting started and a step-by-step stitch guide. The main stitch used to complete the kit is called the chain stitch. You'll also learn a variety of other stitches, including the satin stitch, stem stitch, and french knot. There's no right or wrong way to using the colored threads in your design. Creativity is encouraged! You may want to experiment by adding your own embellishments. Beads, buttons, and metallic threads will add a unique and creative flair to your design. Your completed design will be ready for framing! It can also be used to create a pillow, tote bag, or wall hanging. Visit the Embroidery Kits section for details on these kits and other creative embroidery kits. 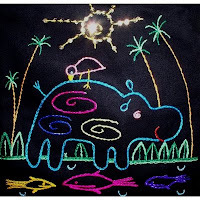 Beginner embroidery kits make learning a new craft easy & fun! Explore a variety of beginner kits at Weekend Kits and be ready to learn a new craft on your next Weekend at Home! New Apron Patterns - Modern & Retro Aprons!